Today any nouveau riche nincompoop with $137,995 can buy a Range Rover Autobiography. But 21 years ago, when an in-car fax machine was next-level baller status and nobody would dare use the word "bespoke" near a Brooklyn thrift shop, the badge meant something. Behold the 1994 Range Rover Autobiography; one of the original run of just 25 SUVs to wear the "Autobiography" badge. The distinctive color scheme was handsome, but having the 200 horsepower 4.2 V8 from the long-wheelbase LSE model was what made this thing a beast. 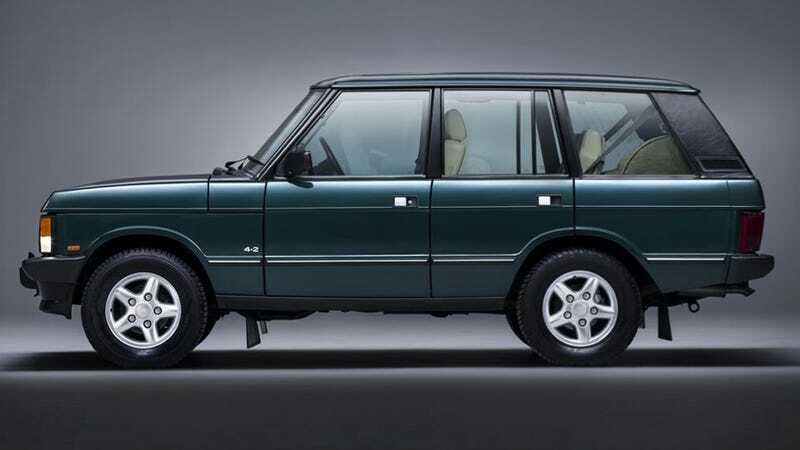 This vehicle was trotted out at the 1993 London Motor Show, and might still be the prettiest Range Rover to ever roll out of Solihull to date. So many people were taken with the Autobiography that Land Rover ended up making it a trim on every generation since. But none have topped the tasteful excellence of this 1994 Classic. Look at those proportions; perfect. The color combination is exquisite, and there's just enough chrome befitting of a true gentleman's gentleman. I asked Land Rover how many of the original pressing are left and what they might be worth today... until we hear back, any guesses? Glorious, glorious images via Land Rover bless them.